As seen in the Despicable Me 2 trailer, Kristen Wiig portrays a secret agent named Lucy who must recruit Gru (Steve Carell) to help save the world. We spoke to Wiig recently and she admitted that due to a personality trait most would consider upstanding, she could never have made it in a career as a secret agent. 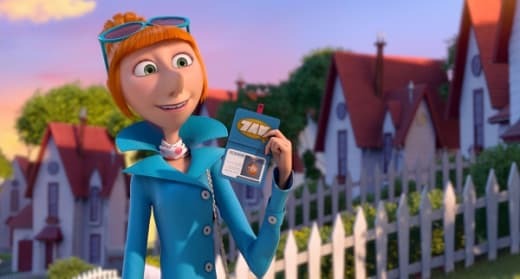 Wiig was actually in the first Despicable Me (she played Miss Hattie, a minor character), and when she heard there would be a sequel, she figured there was no way her character would be brought back. But, to have her asked to play a new character for the franchise… she was blown away. “I knew they were making a second one. I figured, 'Oh, well, my character probably won't be in it because she was with the adoption agency, and he has the kids now.’ When they asked me to be a part of the second one, I don't think I even knew that much about the character. I just said yes,” Wiig said and laughed. Lucy also provides a romantic interest for Gru, something Wiig felt would add so much to the franchise. “She's super into her job, and that maybe was her priority until she met Gru. And I think her opening up something in him. He did the same thing for her,” Wiig said. Wiig is known, whether it in Bridesmaids or her time on Saturday Night Live, for her crazy, out there characters. Although she is enjoying her movie career, she misses the opportunity to be nuts onscreen. She does admit that the great thing about animation is that it allows you to do just that. “It's like, now that I'm not on SNL, I guess the chance to find those crazy characters won't come around as much. That was like a weekly thing of being able to really be fearless and find all those different voices and people,” Wiig admitted.